Hello again. If you’ve been turning blue from holding your breath in anticipation of the next post you can let out that stale CO2 and take a deep breath. Here’s a new post with a couple of birds but something else, too. I was checking through some old photos I have, thinking about what I might want to post just for a change from the digiscoped images. I picked out some shots I took in 1993 when I was traveling in Kamchatka. In My Profile page I mention that I spent a lot of time in Russia, particularly Siberia. In 1993 I spent the month of August in Kamchatka in the Russian Far East traveling with a Russian friend who lived in the capital city, Petropavlosk. She and some colleagues were trying to start up an adventure tour company and I was a “guinea pig”. Tough job, that. My most memorable ”test trip” was our 10-day horse trek in the Koriak Mountains, which are a volcanic mountain chain that extend up the spine of the peninsula. Our guide, Pyotr was a 3rd generation Russian hunter by profession, but was hired by my friend to help with setting up horse treks. Pyotr was one of the most kindly and pure-hearted people that I’ve ever known. He is also the fastest person I’ve ever seen at getting a fire going. Seriously, I’d see him arranging some sticks and 30 seconds later a fire was going. The three of us spent 8 hours a day in the saddle with a 2-hour lunch break. We were lucky in that we’d had bright Colorado blue skies with little rain so the mosquitos weren’t as bad as they could be. I overheard someone say that earlier that year they’d been so numerous it was like you had fur on your arms. On one particular day we had stopped for a brief rest along a stream banked with tall grasses. 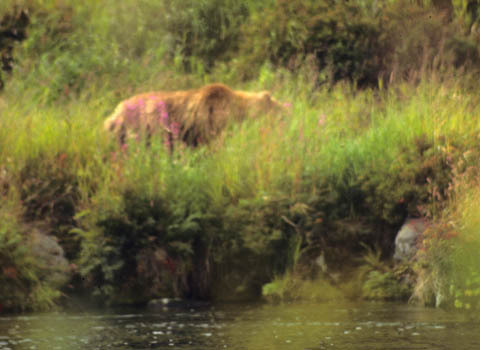 There was a loud swishing on the other side of the stream as something moved through the grass and even as I saw the creature, my mind was still working out what the source of the swishing and hadn’t fully taken in the large brown bear cruising along on the other side of the stream. “Uh huh.” I was still pondering the swish sound. Then…a neuron made it to its receptor and a grand connection took place in my little brain; swish sound, brown bear moving through grass, swish sound, big brown bear swishing through grass right over there across this tiny trickle of a stream. “Ah, boori medved,” I said as if I had been the one to place it first. I put the camera to my eye and clicked off some shots, and prayed the bear wouldn’t take notice of us huddled down behind some skimpy shrubs. It’s possible the bear had known we were there; I don’t know. There wasn’t much breeze in my recollection and we had horses, who I don’t remember reacting either. If the bear had smelled us it never turned its head even once in our direction. It just kept on its merry way, which I guess is a good thing. 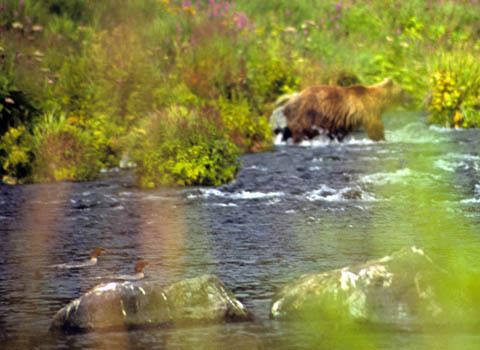 Here it is–Kamchatka’s favorite critter besides salmon. 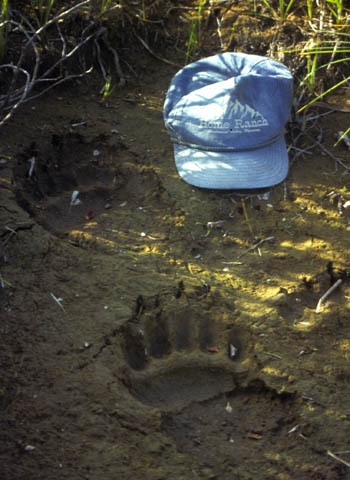 The Kamchatka Brown bear (Ursus arctos), or “boori medved”, which translates from Russian as “grizzly bear”, is larger than its North American cousins, (Ursus horribilus). An average Kamchatka male weighs about 500 kg or 1,100lbs, but some have reached trememdous weights of 1,500 lbs. 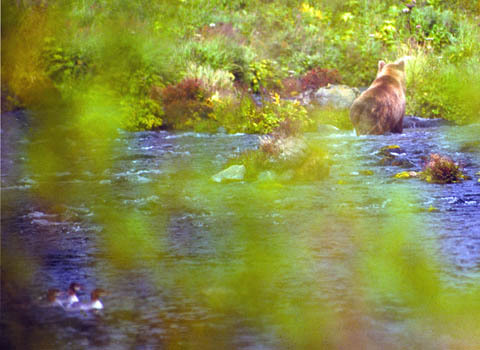 Okay, stop looking at the bear and see if you can find any birds in this photo and ID what they are. I have to say I was relieved to see the hind end of our friend but at the same time I would have liked to watch it some more. The bear, that is, not it’s hind end. And, yes, the ducks are female Common Mergansers. Both Common and Red-breasted Mergansers are found on the Kamchatka Peninsula, but the Common has a sharp delineation between the rust-red on its throat and the white of its breast. There is also a Chinese Merganser in the Russian Far East, which is similar to the Red-breasted but they are found only in the Amur Region and not on Kamchatka. So that makes it easier. Did I mention how big Kamchatka Brown bears get?